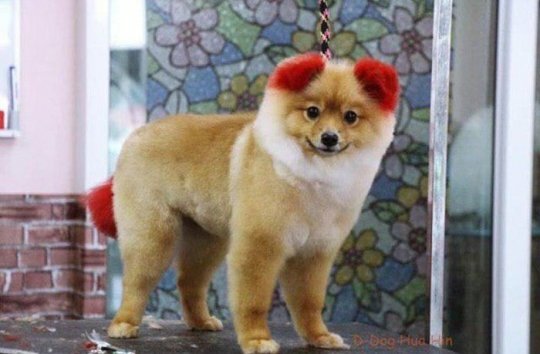 A Pomeranian named Diffy lost both his ears after her owner decided to dye them bright red. 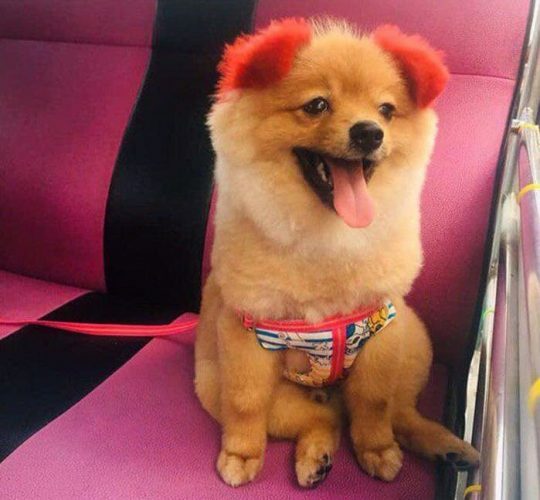 Diffy had been taken to a dog grooming saling on Hua Hin, eastern Thailand, earlier this week where his owner asked for the colour to be put on her dog’s ears and tail. The colour was left on Diffy’s soft blond fur for 40 minutes during the foil wrap dye job with reports it left his ears ‘permanently drooping’ instead of standing up as they did before. 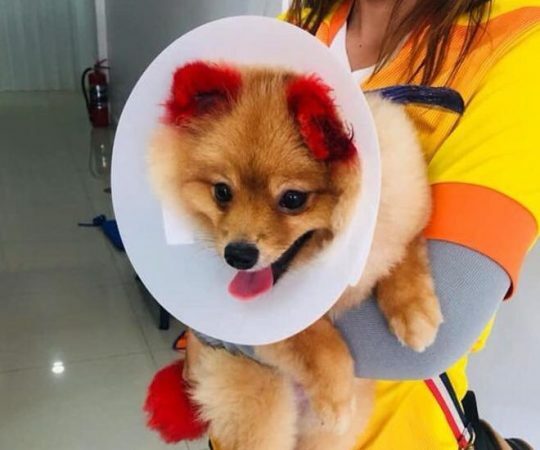 The groomer allegedly told the dog’s owner her pet’s ears would perk up ‘after two or three days’ but Diffy’s skin became red and flakey almost immediately. It is believed Diffy suffered an allergic reaction to the strong colourant and was left with burning, itchy ears. Despite receiving advice from other dog owners who had undergone the same procedure, Diffy’s left ear was so badly affected that yesterday, it fell off. The dog owner said: ‘Diffy’s left ear is now falling off because of the colour dye. The pet groomer put too much dye on him. My dog’s ear was itchy, burnt, turned black, cracked, and eventually fell off. 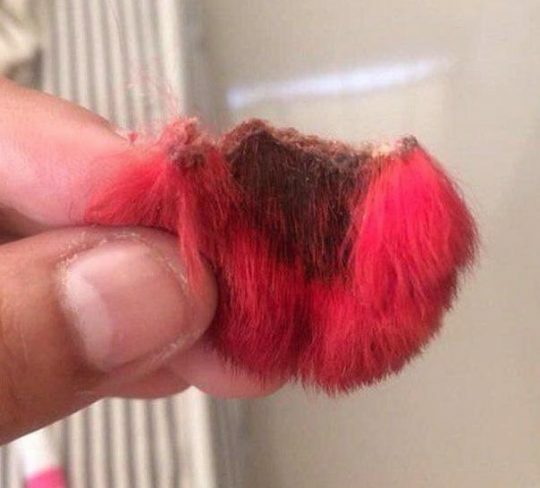 ‘I don’t blame the grooming store but I blame myself for wanting to have his ears dyed.’ She posted a picture of herself holding Diffy’s detached ear which was later shared by vets in the country. Neeyada Sirisampandh, who runs the dog rescue group Mid Road Lover in Bangkok, said: ‘Let this be a lesson to other dog owners. It is dangerous to dye your puppy’s fur. Agree with you Jayne. Cannot abide people who ”tinker” with their dogs. Fine groom them and make sure their fur is kept tidy, nails cut etc. but all the rest…. so unnecessary. See the same warped mentality in kids beauty pageants.